Happy Halloween! It’s the last day of the Paranormal Party. 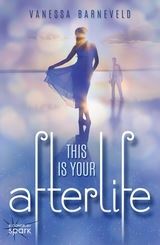 Thanks so much for joining me and my YA writer friends as we celebrate the release of my debut book, This Is Your Afterlife. My lucky last guest is two-time RITA®-nominated YA author and fellow cat lover, Tina Ferraro! We were introduced online by our mutual favourite person, historical romance author Anna Campbell, and finally met in person a little later. She’s funny and warm and one of the most generous souls I know. In addition to a love of all things Anna, we share a love of cats and peppermint tea. We once dined in West Hollywood alongside actor Topher Grace, who we now count as one of our closest friends. 😉 The covers of Tina’s sweet YA books are gorgeous, but I thought I’d show off her first one in the gallery below because it features a prom dress that looks uncannily like my wedding dress. I invited Tina to talk about her upcoming novella, Half-Life (Shine/Leap Books). It’s got a Halloween theme and it’s perfectly paranormal! According to an old wives’ tale, a girl can get a glimpse of her future husband by gazing into a mirror at the strike of midnight on Halloween. Or maybe it’s just wishful thinking passed on by young girls. I was about thirteen years old when word of it came my way, and while I was mesmerized by the prospect, I had more questions-­more worries­-than initiative. What if my Mr. Right was hideous? Or old (you know, like thirty)? What if I saw the weirdo who talked to himself in homeroom, or my best friend’s crush? Or…or…what if I didn’t see anyone at all? Did a no-show suggest I wouldn’t live long enough to get married? Too much risk there. Better to leave well enough alone. But years later, as my writing career began to take shape, I revisited the mirror tale, realizing my fears were now what made it appealing. HALF-LIFE (Leap Books, 2015) was born, opening on teen Trisha and friends at a Halloween sleepover. Trisha gets an eyeful in the mirror, not husband material, but her late twin sister, who is returning to try to keep her from a similarly early demise. Part of the fun of making this sale was sharing the news with Vanessa, who’s been a valued friend since our meet-up at the 2009 Romance Writers of America Conference. We’d both been nominated for Best Young Adult Romances in their contest’s published/unpublished categories, and after instantly hitting it off, decided to sit together at the award ceremony. She wore her pink wedding dress, I wore my late mother’s charm bracelet, and we held hands for luck during the announcements of our categories. Alas, neither of us won, but I like to think we got something even better from it: a lasting friendship. Some months after the conference, I received a surprising e-mail from her: a thank-you for the feedback on an anonymous entry I’d judged in another writing contest. It had been one of the best entries I’d ever judged, and I was delighted by this reveal on many levels. Not only was Vanessa smart, charming and dear friend, ­but woo-hoo, could she write! Since then, we’ve met up on both her continent and mine for meals and drinks and craft talk, have read bits and pieces of each other’s works-in-progress, and cheered the other on. It is an honor to participate in Vanessa’s blog tour. I urge everyone to check out her marvelous book, and learn first hand what the buzz is all about! Tina, fantastic post. I can’t wait to meet Trisha! Thanks so much for being a terrific guest and dear friend. Thank you to all of my other Paranormal Party guests — Pintip Dunn, Amanda Ashby, Sara Hantz, Elizabeth Langston, Shea Berkley, Erica O’Rourke, Kim MacCarron, Stephanie Kuehnert — for posting such creepy but fun stories. It’s almost time to wrap up this party. Before you leave, stick around and share more lore with us! We can’t get enough of the paranormal. How do you celebrate Halloween? Have you got a costume or party lined up? What’s the spookiest thing that’s ever happened to you? Luckiest thing? Strangest coincidence? Last chance to enter my Rafflecopter giveaway! Click HERE to win a Kindle copy of my debut YA and a $50 Amazon e-gift card.